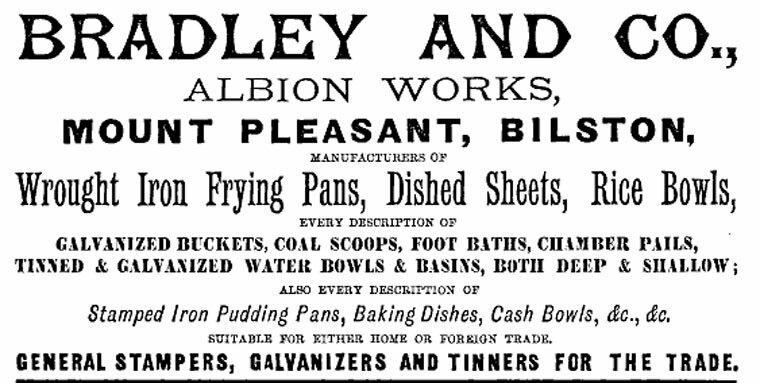 Bradley and Co Ltd. of 9a Albion Works, Mount Pleasant, Bilston, Staffordshire. Telephone: Bilston 41261. 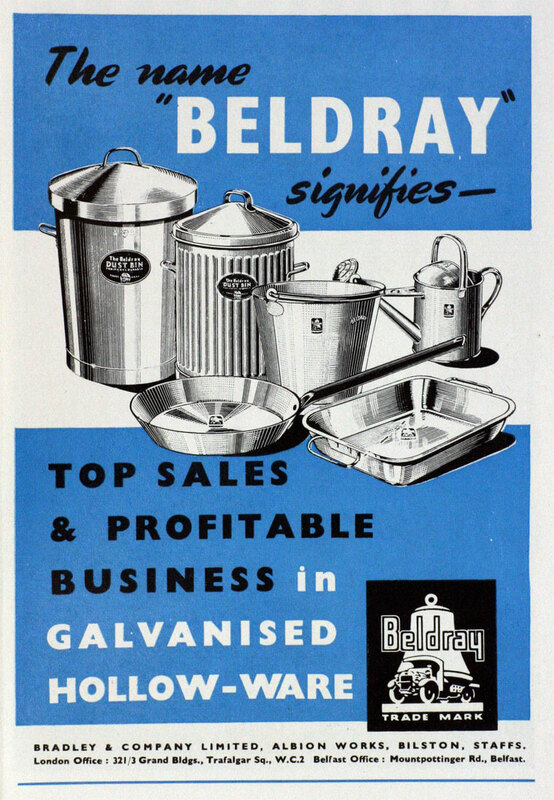 Telegraphic Address: "Galvanic, Bilston"
This company, founded in 1872, was originally called Bradley and Co Ltd, but changed its name to that of its famous trademark - Beldray Ltd. It closed in 2005. 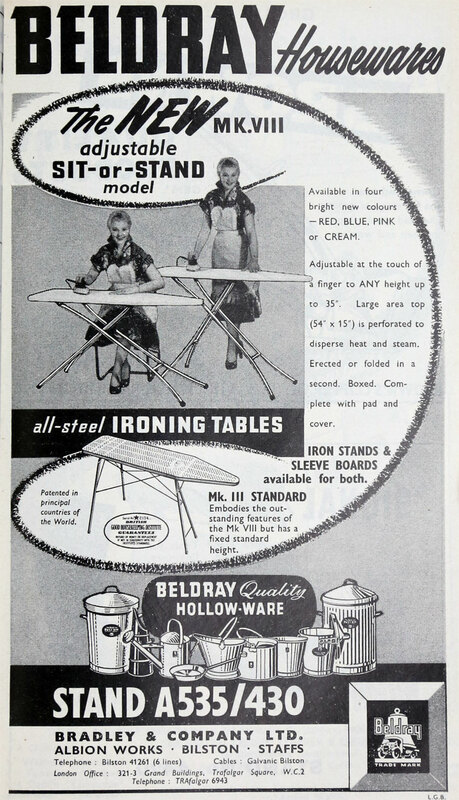 It mainly made domestic hollowware, branched out into art metalware, became famous for its ironing boards and finally added safety equipment to its range. 1854 Walter Smith Bradley was born. He was educated at Wolverhampton Grammar School. His father's firm was Thomas and Isaac Bradley; they made pig-iron and other castings (Caponfield Furnaces). 1870 Walter joined his father’s firm after leaving school. 1872 He established Bradley's at the Albion Works, at about the age of 18. At under 21 he was, in the law of the time, a minor, unable to buy land and with limited powers to enter into contracts. His father probably backed him. The industrial boom in the UK helped the hollowware trade to expand, but it is nor known what the company made at first. 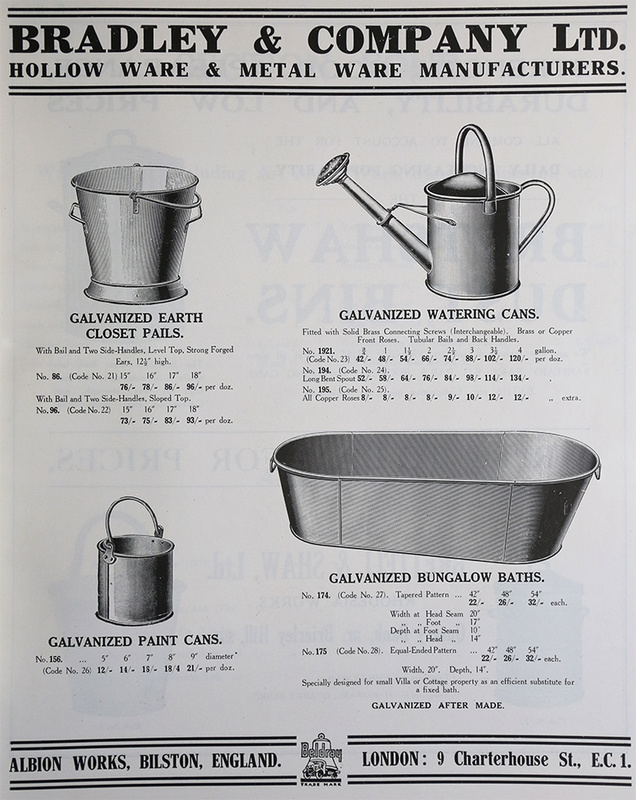 The firm employed about 25 sheet metal workers and produced pans, bowls and galvanised buckets. They rapidly expanded to cover almost anything which could be produced in sheet metal. 1885 Walter Bradley's older son was born and christened Cuthbert Hermon Bradley, (known as Hermon). He joined the company in 1903. His younger son, Hector Claude joined the company later. 1899 The firm became Bradley and Company Limited. Changes in company law allowed private firms to incorporate and gain the advantages of limited liability. 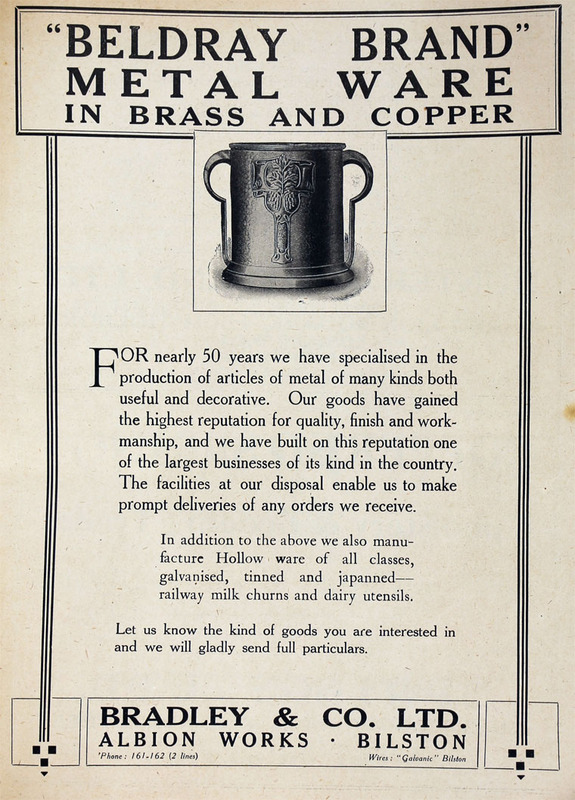 c1903 To meet foreign competition, Bradleys expanded from hollowware into iron stampings, tank making, the manufacture of sanitary ware and introduction of brass and copper wares. 1908 Production included kettles, urns, coal scoops, letter racks, salvers, cake stands, pin trays, fern pots, flower vases, rose bowls, mirrors, plaques, and clocks mounted in antique copper, with decorated dials and fired enamels. The firm is reported as employing "some hundreds of workpeople" and to have the most up-to-date plant and "steam, suction gas and electricity are variously employed as motive power". Walter Bradley was "assisted by his elder son, soon after a younger son entered the firm of Bradley and Co ". Documentation on Beldray give no specific reason for the company entering into this field. 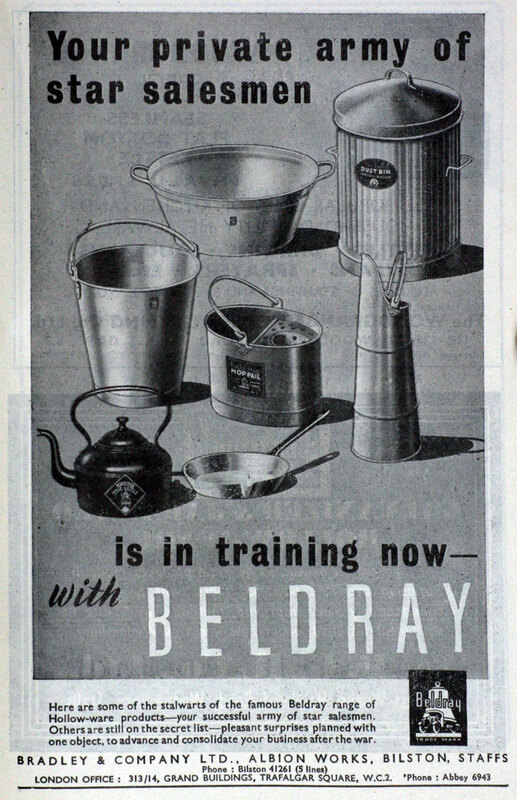 The art metalwares were introduced about the time that the founder's eldest son, Hermon Bradley, joined the firm and it was originally thought that the introduction of the new line may have been something to do with him. The art metalware products were made of brass or copper, with the occasional use of wrought iron for stands and such. The wrought iron work was probably made by Bradley's themselves as there is evidence of a blacksmith on the premises. Copper was also used for other finishes, such as bronzed finish and later, after the introduction of chrome plating to the UK in 1925, for chrome plate. Before that a silvery finish had been obtained by the use of a chemical applied in the same way as the bronze finish. Brassware was also finished in a matt gold. Many of the designs shown in the catalogues and on surviving pieces were obtained by making different combinations of finishes. 1912 Hermon married; his bride was Eleanor M. Bird, who was an heiress of the Bird's custard family. WWI. There are no records, but it is likely that the firm would have been subject to government direction - probably making ammunition or other military equipment. 1918 W. S. Bradley died on 17 March. When company adopted its logo of a bell on a dray is not known. It is likely that the logo was adopted towards the end of, or very soon after, World War I. 1925 Chrome plating was introduced in industry and soon became fashionable. Bradley's took it up early, as a replacement for their "oxidised silver" finish. Some existing designs in copper were produced in chrome versions, copper being a good substrate for chrome plating. They also designed items for the finish, as art deco style became fashionable at the same time. 1932-1939 Trade increased, compared with the depression, the firm went through a boom time. 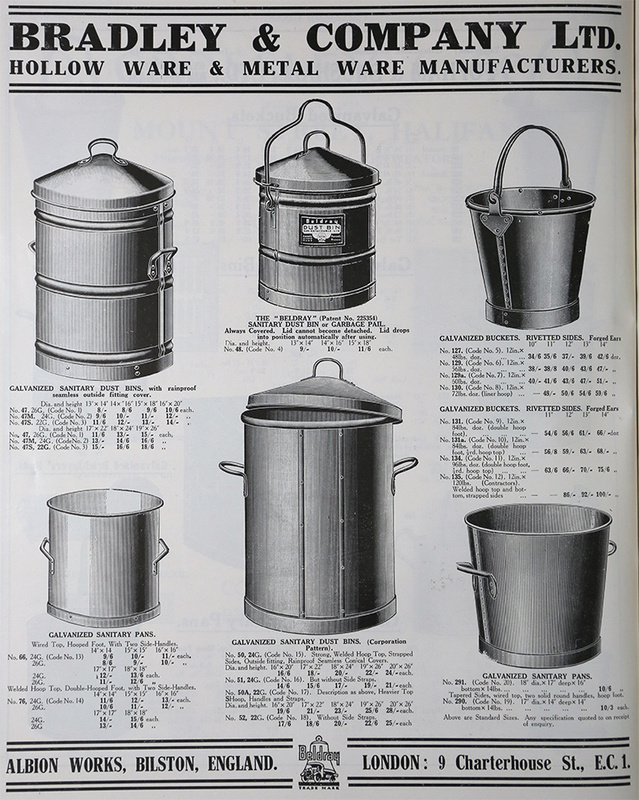 The main products at this time were buckets, baths and bowls, as the skilled work which had previously been carried out on the coppered ware was completely dying out. 1939 Production of art metalware ended. 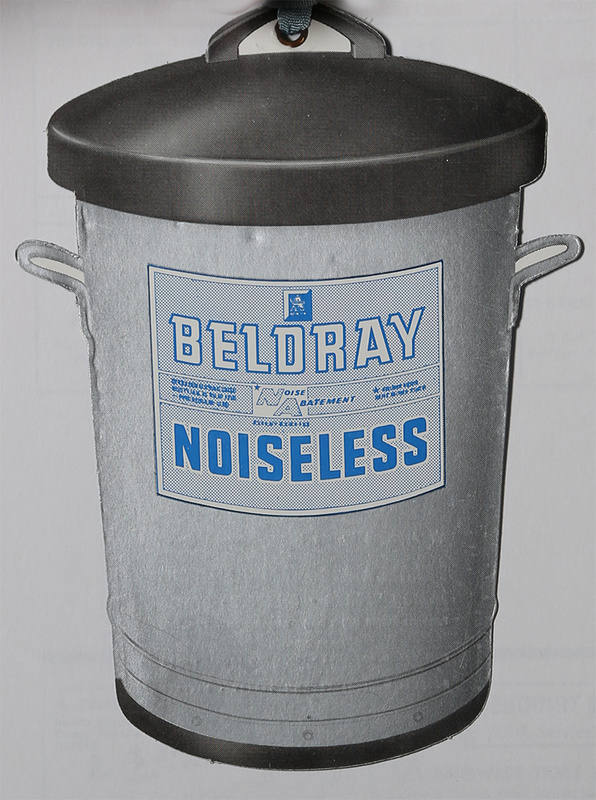 Less and less was being produced in the late 1930s and production ceased altogether at the outbreak of war. The drafting office did produce new designs for a proposed post-war re-introduction of the line, but it never happened. The factory had a blacksmith's shop at one point and the wrought iron work was made there. 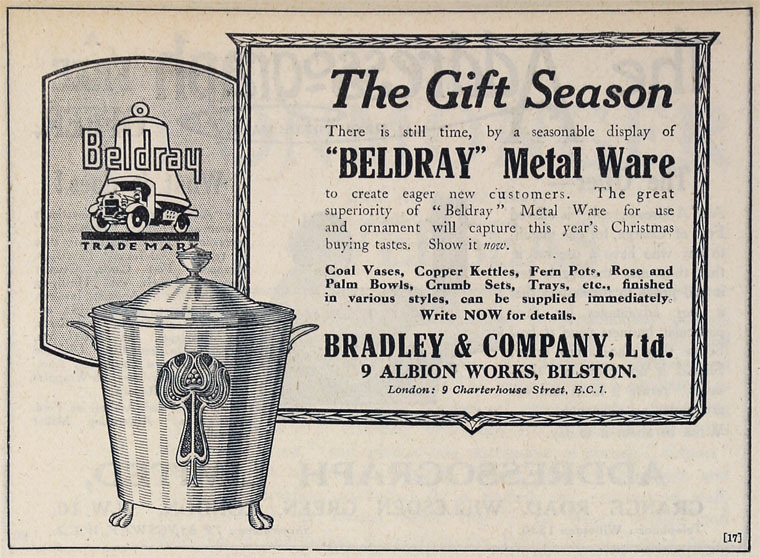 The company also made copper kettles on stands, some of which were of wrought iron (whilst others were of cast brass). Any use of cast iron seems to have ceased by the 1930s. Bradley's trade in these items survived a good deal longer than that of their major competitors, including the local Joseph Sankey and Sons. WWII. During the War, the company was heavily involved in munitions work. Hollowware continued on a much smaller scale and attention turned to bomb tails and other components, mortar bomb casings, small smoke floats (used to generate smoke screens at sea) and countless other things. 1959 On the death of Walter S. Bradley his eldest son, Hermon Bradley became Chairman. He probably remained Chairman until his death some time after 1953. Walter Bradley was a part owner of the Caponfield Furnaces so his company was not his only interest. 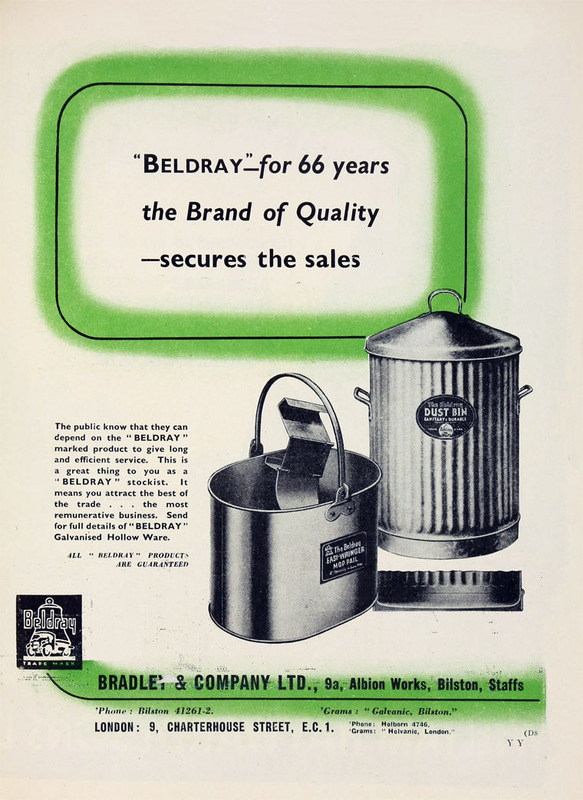 By 1959 the Bradley Group consisted of Bradley and Co Ltd, General Galvanisers, Globe Tank and Foundry, Halladays Drop Forgings, Halladays and Weston Works. In the latter part of 1959 the Bradley Group was absorbed into the Butterfield Group. 1961 Member of the Butterfield Group of companies. Manufacturers of iron and steel fabricated metal products, engineering, housewares, metal stampings and pressings. 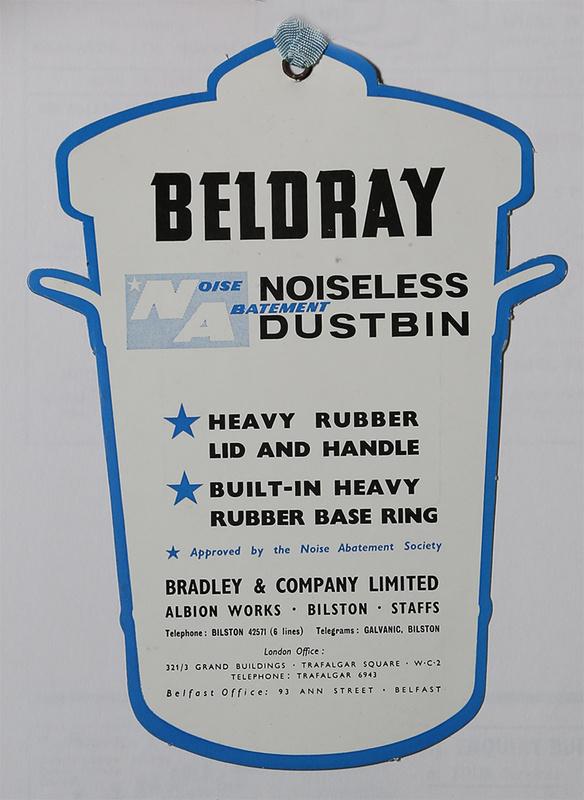 600 employees.  .
1977 On 1 December, the company officially changed its name from Bradley and Company Ltd, to Beldray Ltd. "Beldray" was an anagram of Bradley and had been used as the firm's trade name since at least the turn of the century. 1978 The company announced plans for a massive modernisation and expansion of the factory in Mount Pleasant. Some of the buildings then in use dated back to the foundation of the company; the layout was inefficient, the warehouse regularly flooded in heavy rain and several old mine shafts were found under the buildings. The new buildings occupied a site of nearly five acres. Butterfield-Harvey started selling off bits of their organisation; they sold Bradleys to Krug International, a large American concern. They remained the ultimate owners until about 2000, when a management buy-out took place. 2002 The firm made 47 of its workers redundant as part of a restructuring process. The company still retained 324 people. 2003 The company announced that it was moving production to the Far East and was reducing its work force from 300 to 100. But this never happened. 2004 The company called in the receivers. This page was last edited on 18 November 2018, at 15:54.